Tune in tonight at 9 PM for a special hour-long Arts and Answers. 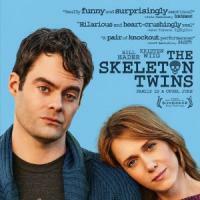 The show will feature an interview with Jenny Lee, producer and editor of the independent film "The Skeleton Twins". The film stars Kristin Wig and Bill Hader as estranged twins Maggie and Milo, who are reunited after cheating death on the same day. Lee discusses the film, her editing process, and her transition from editing comic books to editing feature film. The Skeleton Twins is currently playing at Nitehawk Cinema in Williamsburg, Brooklyn.